"Chakat", "Pegataur", and "Werevamp" redirect here. For other uses of "hybrid", see Hybrid (disambiguation). Assyrian Shedu from the entrance to the throne room of the palace of Sargon II at Dur-Sharrukin (late 8th century BC), excavated by Paul-Émile Botta, 1843–1844, now at the Department of Oriental antiquities, Richelieu wing of the Louvre. Hybrid beasts, i.e. creatures composed of parts from different animals, appear in the folklore of a variety of cultures as legendary creatures. Remains similar to those of mythological hybrids have been found in burial sites discovered by archaeologists. Known combinations include horse-cows, sheep-cows, and a six-legged sheep. 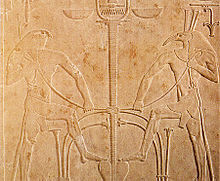 The skeletons were formed by ancient peoples who joined together body parts from animal carcasses of different species. The practice is believed to have been done as an offering to their gods. These forms' motifs appear across cultures in many mythologies around the world. Partly human hybrids appear in petroglyphs or cave paintings from the Upper Paleolithic, in shamanistic or totemistic contexts. Ethnologist Ivar Lissner theorized that cave paintings of beings combining human and animal features were not physical representations of mythical hybrids, but were instead attempts to depict shamans in the process of acquiring the mental and spiritual attributes of various beasts or power animals. Religious historian Mircea Eliade has observed that beliefs regarding animal identity and transformation into animals are widespread. The iconography of the Vinca culture of Neolithic Europe in particular is noted for its frequent depiction of an owl-beaked "bird goddess", although this interpretation is being criticized as feminist archeology. Examples of humans with animal heads (theriocephaly) in the ancient Egyptian pantheon include jackal-headed Anubis, cobra-headed Amunet, lion-headed Sekhmet, falcon-headed Horus, etc. Most of these deities also have a purely zoomorphic and a purely anthropomorphic aspect, with the hybrid representation seeking to capture aspects of both of which at once. Similarly, the Gaulish Artio sculpture found in Berne shows a juxtaposition of a bear and a woman figure, interpreted as representations of the theriomorphic and the anthropomorphic aspect of the same goddess. Non-human hybrids also appear in ancient Egyptian iconography as in Ammit (combining the crocodile, the lion, and the hippopotamus). Mythological hybrids became very popular in Luwian and Assyrian art of the Late Bronze Age to Early Iron Age. The angel (human with birds' wings, see winged genie) the mermaid (part human part fish, see Enki, Atargatis, Apkallu) and the Shedu all trace their origins to Assyro-Babylonian art. In Mesopotamian mythology the urmahlullu, or lion-man served as a guardian spirit, especially of bathrooms. The Old Babylonian Lilitu demon, particularly as shown in the Burney Relief (part-woman, part-owl) prefigures the harpy/siren motif. In Archaic Greece, Luwian and Assyrian motifs were imitated, during the Orientalizing Period (9th to 8th centuries BC), inspiring the monsters of the mythology of the Classical Greek period, such as the Chimera, the Harpy, the Centaur, the Griffin, the Hippocampus, Talos, Pegasus, etc. 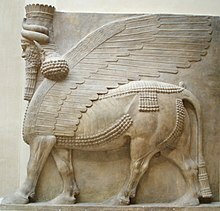 The motif of the winged man appears in the Assyrian winged genie, and is taken up in the Biblical Seraphim and Chayot, the Etruscan Vanth, Hellenistic Eros-Amor, and ultimately the Christian iconography of angels. The motif of otherwise human figures sporting horns may derive from partly goat hybrids (as in Pan and the Devil in Christian iconography) or as partly bull hybrids (Minotaur). The Gundestrup cauldron and the Pashupati figure have stag's antlers (see also Horned God, horned helmet). The Christian representation of Moses with horns, however, is due to a mistranslation of the Hebrew text of Exodus 34:29–35 by Jerome. The most prominent hybrid in Hindu iconography is elephant-headed Ganesha, god of wisdom, knowledge and new beginnings. Both Nāga and Garuda are non-hybrid mythical animals (snake and bird, respectively) in their early attestations, but become partly human hybrids in later iconography. The god Vishnu is believed to have taken his first four incarnations in human-animal form, namely: Matsya (human form with fish's body below waist), Kurma (human form with turtle's body below waist), Varaha (human form with a boar's head), Narasimha (human form with lion's head). Kamadhenu, the mythical cow which is considered to be the mother of all other cattle is often portrayed as a cow with human head, peacock tail and bird wings. ^ Laura Geggel (July 21, 2015). "Horse-Cows? Bizarre 'Hybrid' Animals Found in Ancient Burials". LiveScience. ^ Steiger, B. (1999). The Werewolf Book: The Encyclopedia of Shape-Shifting Beings. Farmington Hills, MI: Visible Ink. ISBN 978-1-57859-078-0. ^ a term of Marija Gimbutas', see e.g. The language of the goddess: unearthing the hidden symbols of western civilization San Francisco: Harper & Row; London: Thames and Hudson (1989). ^ Talalay, Lauren E. (October 1999). "Review of: The Living Goddesses". Bryn Mawr Classical Review. ISSN 1055-7660. ^ Black, Jeremy A. and Anthony Green (1992). Gods, Demons and Symbols of Ancient Mesopotamia. University of Texas Press. ISBN 978-0-292-70794-8. ^ Wiggermann, F. A. M. (1992). Mesopotamian Protective Spirits: The Ritual Texts. Styx. ISBN 978-90-72371-52-2. Nash H. Judgment of the humanness/animality of mythological hybrid (part-human, part-animal) figures // The Journal of Social Psychology. 1974. Т. 92. №. 1. pp. 91–102. Nash H. Human/Animal Body Imagery: Judgment of Mythological Hybrid (Part-Human, Part-Animal) Figures // The Journal of General Psychology. 1980. Т. 103. №. 1. pp. 49–108. Nash H., Pieszko H. The multidimensional structure of mythological hybrid (part-human, part-animal) figures // The Journal of General Psychology. 1982. Т. 106. №. 1. pp. 35–55. Nash H. The Centaur’s Origin: A Psychological Perspective // The Classical World. 1984. pp. 273–291. Pires B. ANATOMY AND GRAFTS: From Ancient Myths, to Modern Reality  / Pires M. A., Casal D., Arrobas da Silva F., Ritto I C., Furtado I A., Pais D., Goyri ONeill J E. / Nova Medical School, Universidade Nova de Lisboa, Portuguese Anatomical Society, (AAP/SAP), PORTUGAL. Posthumus L. Hybrid monsters in the Classical World: the nature and function of hybrid monsters in Greek mythology, literature and art. Stellenbosch: University of Stellenbosch, 2011.